Have you heard these weight loss myths? Eat fewer calories to lose weight, slow metabolism is hereditary, my metabolism is slow so I will never be able to lose weight, and so on. Let's take each one and see where the truth is hiding. While it is true that in order to lose weight, you need to burn more calories than you eat, one of the common weight loss myths is that reducing calories alone will get the weight off. The truth is that over time, a stringent low-calorie diet can cause the body to go into starvation mode, slowing down the metabolism to promote survival. Eater smaller portions more frequently. Research from Georgia State University shows that people who eat every 2 to 3 HOURS have less body fat and faster metabolisms than those who eat only 2 or 3 meals per DAY. Small, frequent meals speed up your metabolism and you burn more calories. Metabolism and physical activity are important aspects of the weight loss equation and need to be considered - as well as diet. This is one of the more complicated weight loss myths. Food labeling is notoriously misleading. While the FDA regulates claims like sugar-free, reduced, and no added sugars, there is no such measure governing "low sugar." Eat more lean protein and less fat and carbohydrates. Your body burns twice as many calories digesting high-protein foods such as eggs, chicken, or nuts, as it does foods that are high in carbs or fat. And, by eating more lean protein, and less carbohydrates, you will also find you have fewer cravings for sugars. Genetic influence on your metabolism is less than 5%. When the entire family has weight issues it is more likely a problem of learned behaviors and habits. Changing habits can be easier and quicker than you might think. Using your mind to help you change behaviors and habits is the whole purpose of this website. 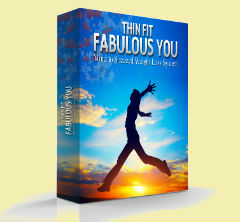 See our Thin Fit Fabulous You product for more info on getting started now using the power of your mind to lose weight. Don't be confused by any one of these weight loss myths. Everyone -- no matter how old, overweight, or out of shape -- has the power to increase his/her metabolism. There is no truth at all to this one. It's true that your metabolism slows down when you age, but it is not inevitable. It occurs because people become less physically active as they age. Research shows that people who preserve their physical activity levels throughout their lifetime can expect to see only a 0.3% metabolic decline per decade. -- only a 1% to 2% total drop over their whole lifetime. Your thyroid gland does regulate your metabolism. Sometimes people with a slow metabolism do have thyroid issues - but that represents less than 5 % of the people over 50 - and most of those conditions are treatable. If you feel you may have a thyroid issue, your doctor can work with you to get your thyroid back in balance. This is one of the weight loss myths that can cause you a lot of trouble. It is just the opposite of what you want to be doing. Instead, Eat less more often. Research from Georgia State University shows that people who eat every 2 to 3 hours have less body fat and faster metabolisms than those who eat only 2 or 3 meals per day. Each time you eat, you stimulate your metabolism for a short period of time. The true steps to take to help you break free of these weight loss myths, once and for all. Include Muscle building activity - or strength training into your exercise regime. Every extra pound of muscle you carry can burn up to 50 additional calories just to maintain itself -- and with no effort on your part. Add interval training to your aerobic workout. Maximize the calories you burn after exercise by integrating high intensity interval training into your workout. You can burn another 100 to 200 calories with this strategy: Alternate 3 minutes of moderate intensity aerobics with 30 seconds of all-out effort. Take a fish oil supplement. Fish oil increases levels of fat-burning enzymes and decreases levels of fat-storage enzymes. For the best metabolism boosting benefit, at least 300 milligrams of EPA and DHA total, is what is recommended. Follow the Thin Fit Fabulous You Food Combining eating strategy. This strategy will allow you to be completely satisfied, benefit from a healthy diet and speed up your digestion and nutrient absorption. You won't have to measure food or count calories. You can eat out without worry and stay fit for life.